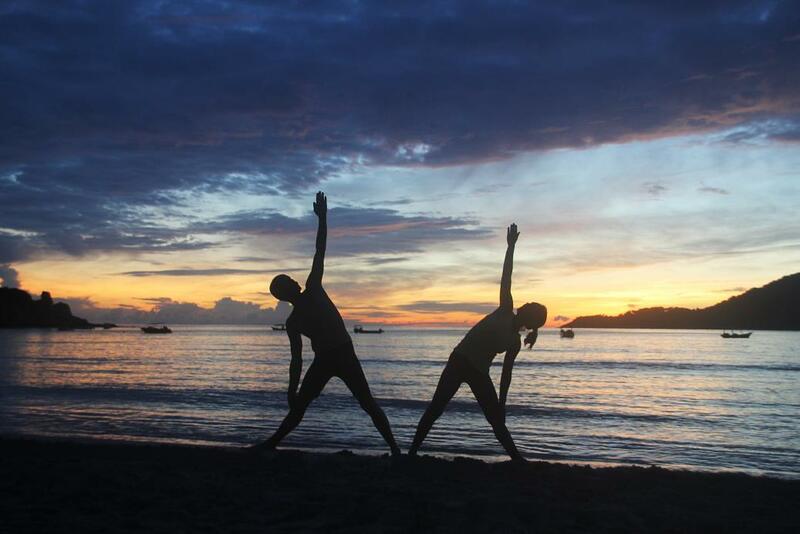 Sunrise- and sunset-Yoga directly on the beach, including purification, pranayama, yoganidra, meditation, asanas … Beside the Yoga classes You learn basics of Thai-Yogamassage wich we will use for partnerwork to improve flexibility. You can also help your family and friends at home to relax. Lecture about Indian philosophy we can add optional for those of you who like to have it. There are plenty of possibilities to widen your own limits, to improve alignment, flexibility and the energyflow in the meridians (energylines/chinese medicine) and to release tension in muscels and nerves. That helps you to live more healthy and more happy. Beside the teaching you have a lot of time to relax, to go snorkeling or even diving. Thai-Yogamassage, partnerwork and technics wich you can use to help friends and family at home, different kinds of meditation, mantras and – optional – Indian philosophy. further courseinfo: All teaching is on the beach, so we ajust to the shadow. The days start with purification at 6:00 a.m. and sunrise-yoga and end with sunset-yoga (allthough this beach is a sunrisebeach) and meditation. From day 2 onwards you practise easy technics of Thai-Yogamassage in partnerwork for about 1 hour, and in the afternoons you will learn new ones. Inbetween you choose if you like to join 1 hour of Indian philosophy. around the classes there is plenty of time for relaxing, snorkeling or even diving. It is possible to join the courses – YES! Thaimassage – what is it? The official name in Thailand is “Nuad Thai”. Traditional Thaimassage (TTM) dates back to the time of the Buddha, 2500 years ago. The massage is given on the full body, no oil is used and you are wearing the same clothes as if doing Yoga. Because of it’s familiarity with Yoga some people name it “Yoga-Massage” or even “Yoga for lazy people..”. Several Yoga-Asanas you will find in the TTM. The masseur helps with pressure and weight of his own body to achieve good stretchings. The other part of TTM which shows the connection with Yoga and Ayurveda is pressing the energy-lines of the body. These lines are called “Sen” in TTM, “Nadis” in Yoga and Ayurveda and “Meridians” in Traditional Chinese Medicine (TCM). In order to balance body and mind the free flow of “Prana” (life energy) in these channels will be arranged. Further influence of TCM is to be seen in the “wind concept”. Specific points called “wind channels” (like main intersections of Nadis) are pressed for a longer time and released very slowly afterwards. The effect can be very strong – like a tide wave going through the body. TTM can be given at every age and – with the exception of some diseases – at every point of physical fitness and flexibility.